Enjoy Utah! 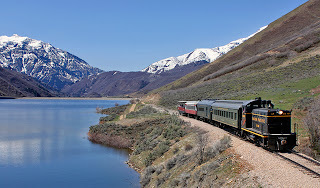 : Upcoming Heber Valley Railroad Events! Upcoming Heber Valley Railroad Events! Mark your calendars! One of our favorite Utah attractions, the Heber Valley Railroad, has a lot of fun events coming up that you don't want to miss! Special Olympics Utah Train-Pull Fundraiser Saturday, September 15th Fifteen-member teams from Utah’s public safety sector, along with their families and coworkers, will pull a 125-ton locomotive thirty feet. Funds raised will benefit the Law Enforcement Torch Run for Special Olympics Utah. Entry Fee: $10.00 per person (15 members per team) Location: Heber Valley Railroad (450 South 600 West, Heber City) Event Begins: 10:00 AM Event Ends: 1:00 PM Food: Snacks and cold drinks available in the Heber Valley Railroad depot.